Emerging at night to feast on a wide variety of plants, slugs are a slimy pest that can do a lot of damage to a garden. Vegetables, ornamentals, flowers — nothing is safe from slugs, which chew on leaves and stems alike. In addition, they leave behind trails of slime, which can be a task to remove from crops. “Slug slime, once it dries, is pretty hard to get off,” said Jim Dill, pest management specialist at the University of Maine Cooperative Extension. To combat these terrestrial mollusks, gardeners have come up with a variety of techniques, some more effective than others. 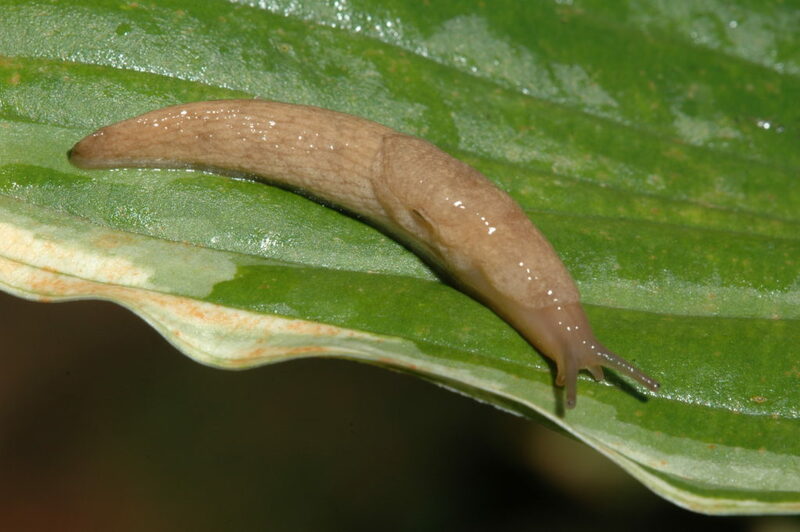 Slugs dry out easily in the sun, so they typically feed at night and seek shelter in moist, shaded areas during the day. Flint suggests removing these sheltered spots, such as piles of weeds and leaves. Boards, rocks, logs and dense growth can also serve as shelter for slugs. “Try to change the environment so it’s not so favorable to slugs,” Flint said. Because slugs seek shelter close to the plants they’re feeding on, creating a trap for them is easy. Simply place a board or a newspaper in your garden. “The idea is, when the morning comes, the slugs hide underneath that, and then you can remove the slugs that are there,” said Jeffrey Hahn, entomologist for the University of Minnesota Extension. An hour spent hand-picking and destroying slugs can noticeably reduce the population, according to the University of Maine Cooperative Extension. Because slugs hide as the sun climbs, it’s best to pick them early in the morning, while they’re still out and about. Wear gloves to avoid getting your hands coated with the slim they produce, and if you’re not keen on squishing them, you can simply drop them in a bucket of soapy water, Flint said. Placing shallow dishes filled with beer in your garden is a tried-and-true trap for slugs. If you have a big slug problem, one option is to plant species that slugs typically don’t attack, such as plants with highly-scented foliage like lavender, rosemary and sage, Flint said. Ferns and geraniums are also often shunned by slugs. Copper tape or wire is often used as a slug barrier, especially around raised bed gardens. While it’s unclear exactly how this metal repels slugs, pest experts believe it has to do with the high conductivity of the material. Flint said that a barrier made of copper tape that is at least 2 inches wide is the best, while Dill suggested creating the barrier with two perpendicular copper wires. With a fly screen, create a 4-inch-tall fence around the plants that slugs are attacking. Leave the top of the fence rough cut, so the metal wires form tiny spikes along the edge. Slugs will have a difficult time climbing over this small barrier. Since slugs thrive in moist environments, it may help to keep the foliage and ground in your garden relatively dry by watering plants directly rather than using sprinklers. Slugs avoid crawling over anything that’s dry or scratchy, such as diatomaceous earth, cinders, coarse sawdust, gravel or sand, according to University of Maine Cooperative Extension. Creating a border of these materials around your garden can keep some slugs out or slow them down enough so they dry out. However, these materials become ineffective when it rains, which is often when slugs travel the most and do damage. Iron phosphate and metaldehyde baits are effective in controlling slugs. However, for many gardeners, pesticides are used as a last resort because they can kill other animals, including beneficial insects and birds. These baits can also be a danger to pets and children. When using pesticides, it’s always important to read the label and follow the instructions.